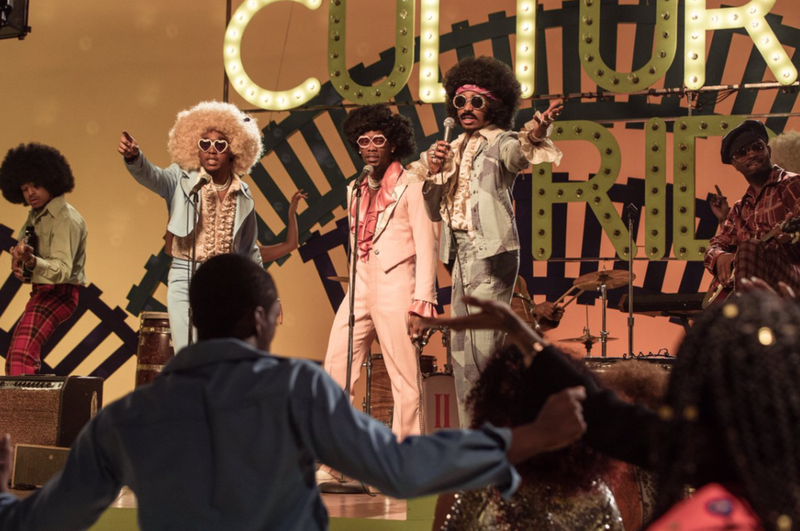 Giving reverence to the 70’s, Migos’ “Walk It Talk It” video is a blast back in time. Featuring a Jerri-curled Drake the soul-infused visual directed by Daps takes us on a culture ride similar to that of the 1971 show, Soul Train. That of which we got an appearance from Jamie Foxx who played the hostess with the mostest. From the dance moves to the afros and most notably, the outfits, “Walk It Talk It” is a masterful work of art. A display of “fashion... funk and soul” Costume Designer and Glam Artist Rasheeda Ameera is a complete visionary. Having worked on the “Walk It Talk It” set, she helped to bring to life this one of a kind visual. From the vintage wardrobe pieces to the wigs, everything was reminiscent of the era and came together perfectly. Creating iconic moments not only for Migos but, the likes of Tyga, Big Sean and Gucci Mane we spoke with Ameera about her start in costume design, pursuance of it as a career and recent experience working on the “Walk It Talk It” set. How did you first get into costume design? I first got into costume design at a young age of ten making clothes for my dolls and myself but, when I moved to L.A. I was assisting my mentor Maxi, and he had me work on all the projects doing hair, makeup, and costume design. At what point did you decide to pursue it as a career? I had started my own clothing line when I was 18 and worked for numerous clothing companies being their sample seamstress. When I was on set with Maxi, he really inspired and pushed me to be a costume designer so, about six years ago. Most recently, you worked on Migos featuring Drake “Walk It Talk It” video. How did you go about researching costume ideas to help guide your wardrobe choices? I watched a lot of Soul Train YouTube videos and discussed the 70’s with my mom. Was it all vintage or were some of the pieces custom? Most of the pieces were vintage but, I did reach out to designers like Gorjeti and MelianJ for custom pieces. Tell us about the wigs used in the video. I ordered so many wigs off of Amazon for the shoot but, that still wasn’t enough. The day of I had to go out shopping for about ten more wigs. Costumes are personality pieces, how do you think each piece played into the personality of each artist? I think each piece played very well with the cast and artists. It was all about expressing the culture. What story did you want the costumes to tell? I wanted them to show fashion, individuality, color, funk, and soul. Which look would you say was your favorite? There were so many looks. I definitely have my top five but, I couldn’t narrow it down to just one. What’s been the best part about working on the set of “Walk It Talk It”? The best part was watching it all go down. Dressing the cast for the dance floors and listening to the vibes that were playing. I really felt like I was in the 70’s on soul train. Also working with Jaime Foxx was a major highlight of my career.